The Alhambra remains as one of my favourite places in Spain 🙂 Charming! Spain is one of our favorite countries and, lucky for us, living next door in Portugal gives us a get-away visit any time we like without much planning. 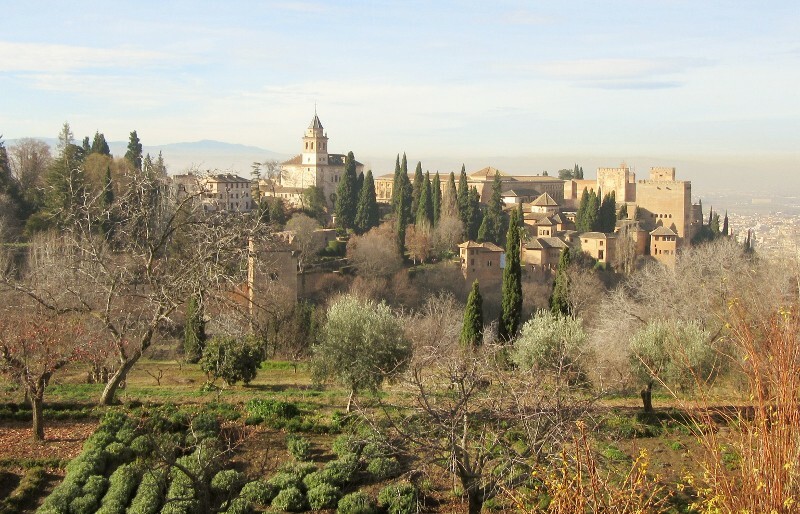 We’re amassing quite a list of favorite places we’ve loved in Spain but yes, the Alhambra is in the top 10. It’s magnificent! It would have been amazing to see it when it was intact and at it’s finest because the remaining ruins show some beautiful artistry and workmanship. 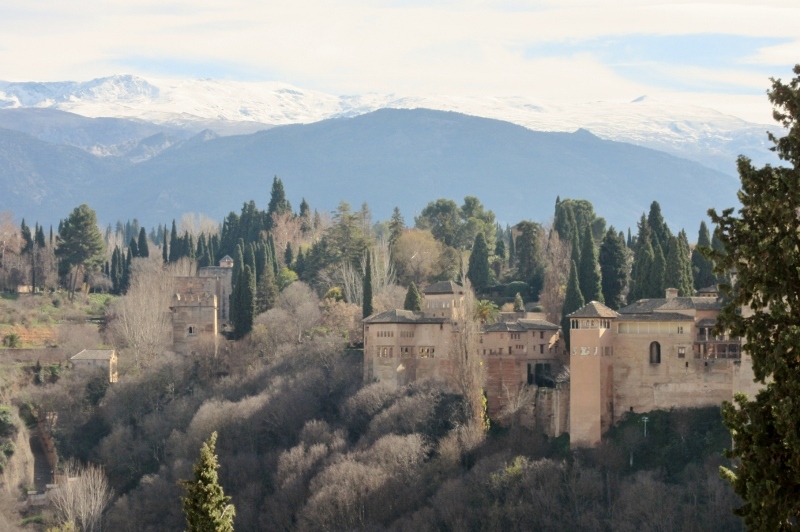 The size of the Alhambra alone, set against the Sierra Nevada mountains, is also breathtaking! Thank you so much for all the likes on my new blog! I am so jealous of your Portugal residency visa. My husband is Brazilian but his grandmother was Portuguese. We are going to start working to get his citizenship there so we can be there too. It’s such a beautiful country! I am very excited I found you and can’t wait to follow your posts. Your pictures are beautiful and I love that you incorporate some history into your posts! My favorite. This really took me back in time! I was there in about 1989 and there weren’t 8,000 a people a day coming to visit! I was out in the garden you show with the sprinklers. Only thing is that they weren’t on when I went into the garden but they came on very enthusiastically and soaked me to the skin. My then-boyfriend didn’t mind! Good memories – thanks. So glad you enjoyed your (very wet) trip down memory lane, Kay. Like so many other places, it sounds like tourist interest has increased steadily over the years, especially to UNESCO WHS. Getting tickets into the Alhambra can be difficult now at certain times of the year and the online tourist sites advise that interested people buy them well in advance. It seems to us that battling the crowds during peak season would spoil a lot of the tour nor would you have time to examine certain areas more closely or even take pictures. Such a stunning place to visit and your pictures do a great job of capturing it. The Sierra Nevada as a backdrop adds even more to its splendour. I would love to visit it one day and like you I will probably go in the off season to avoid the crowds. I guess we failed to notice in our initial research that the Sierra Nevada range was so close to the Alhambra and it, along with the ancient Roman wall, caught us by surprise. We try to avoid the crowds whenever possible and traveling during the off season and avoiding major holidays is the best way to way to do that. Sometimes you miss things like the gardens in bloom but you gain the chance to take some photos without a stranger (and a selfie stick!) marring the image. 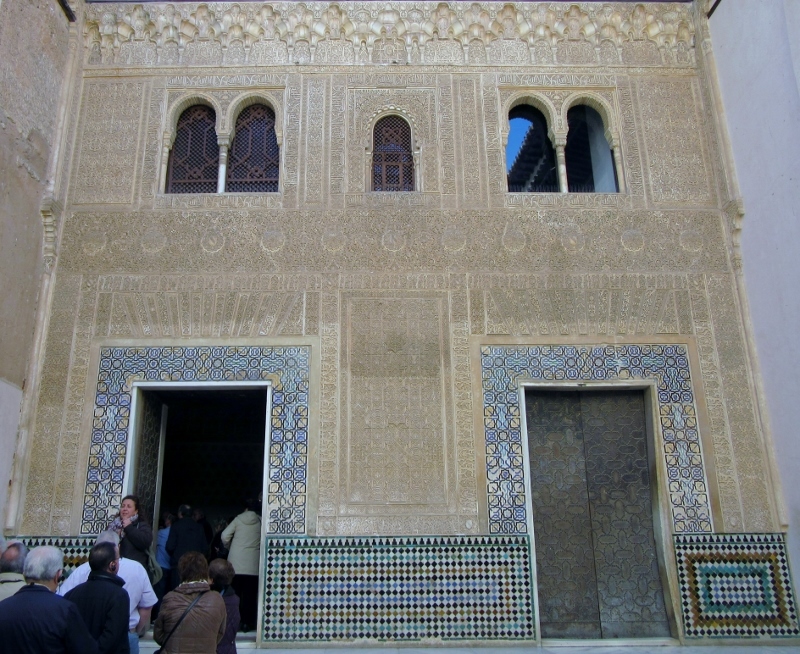 I thoroughly enjoyed your story on the Alhambra. You did a splendid job of walking us through the history and taking us on a tour through this beautiful historic place. Great photos too! Thanks Sue for your kind words. It’s fun to blog about places we’ve visited and we feel that writing about our experiences makes us much better travelers – more aware of our impressions of a place as well as paying attention to the details. And think of everything we learn along the way! 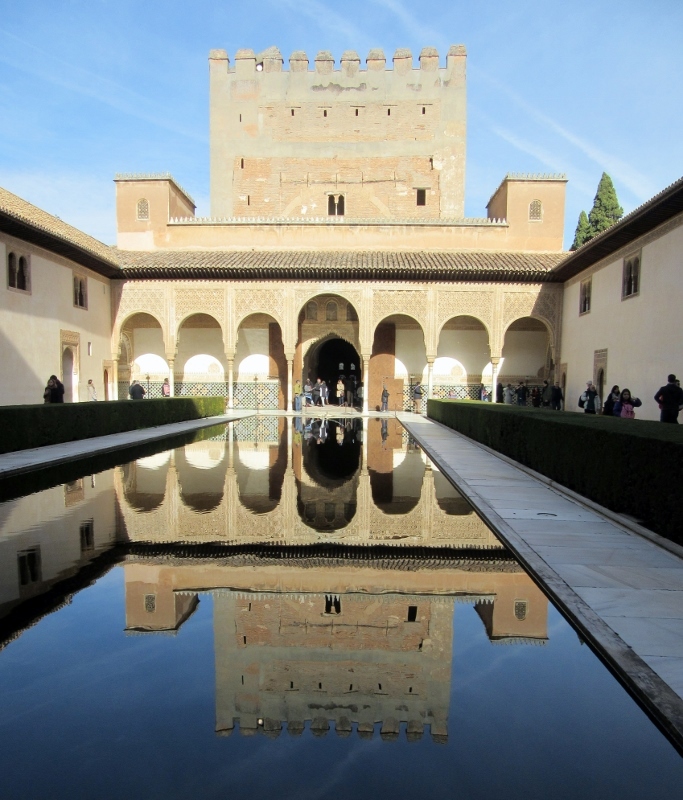 Love the Alhambra and this post makes we want to go back for a visit. I think I’ll combine that with a return to the Sagrada Familia in Barcelona and get a real eyeful! Sounds like a trip to Spain is on your horizon. 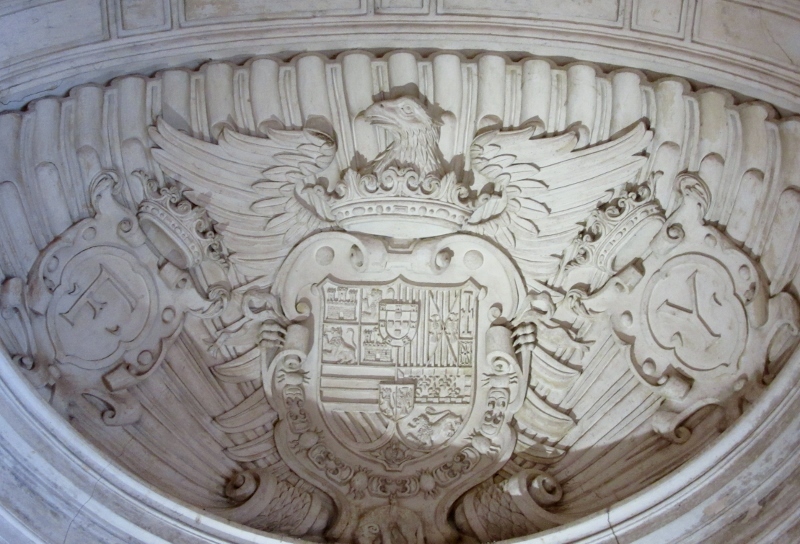 We too have many more travels to and around Spain as it is a country with a fascinating history. architecture spanning many different centuries and styles and amazing food. And we’d love to return to Barcelona to visit places we missed. How lucky we are to live so close! I agree it is such a magnificent palace, I would love to go back since it has been over 5 years since I went to see this amazing place and I didn’t even have a blog then so the pictures are lost somewhere in time. We’re planning a re-visit with friends in a few months and would love a chance to slow down on this second time around and rent the audio tour to appreciate details we missed on our first tour. 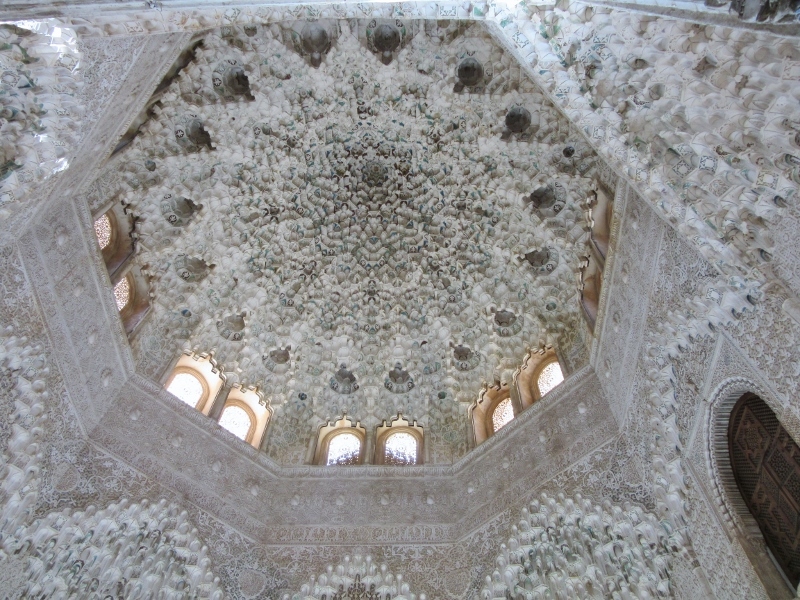 I hope you do get a chance to return to the Alhambra – I know your photos would be amazing! During our last visit to Spain (in 12/2015), we visited Cordoba, another of the cities in southern Spain that is the location of beautiful Islamic art and architecture. Our last visit to Granada and the Alhambra was in 1981. Your narrative and photos have reminded me that they are well worth a re-visit. We’re planning another visit to Spain in May (how lucky we are to have this traveler’s delight so close by!) and Cordoba is on our list of places to see, especially because of its history and architecture. 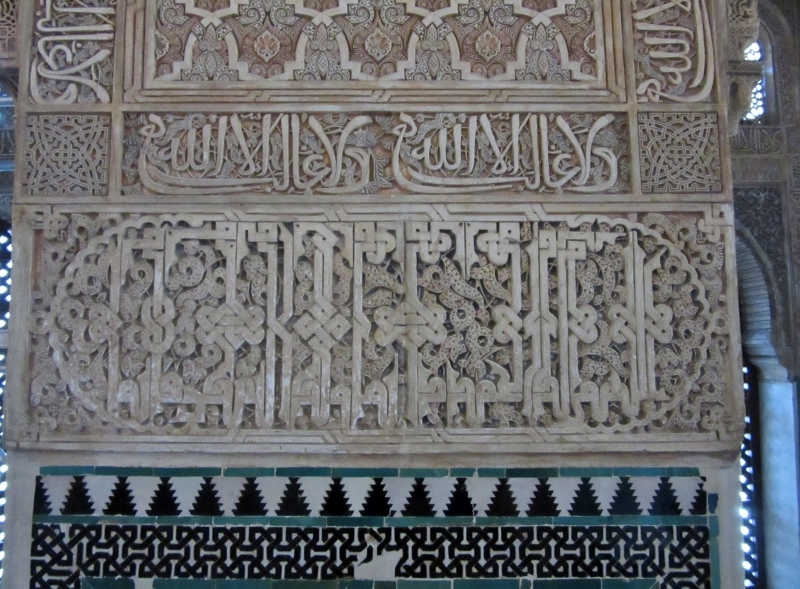 One thing I can predict about the Alhambra if you re-visit it – it won’t have changed much but your appreciation of it will probably be much greater! 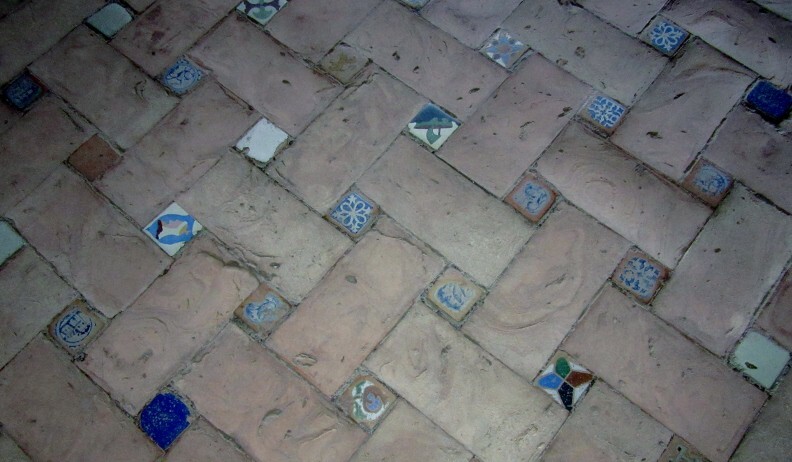 The Moore’s were amazing artists and architects and we, like you Susan, love all the details and ornate patterns that make up their amazing buildings, mosaics, carved stucco and tiles. We’ve seen several examples of Islamic designs in the last couple of months and the intricate details are really astonishing and beautiful. What an amazing place. 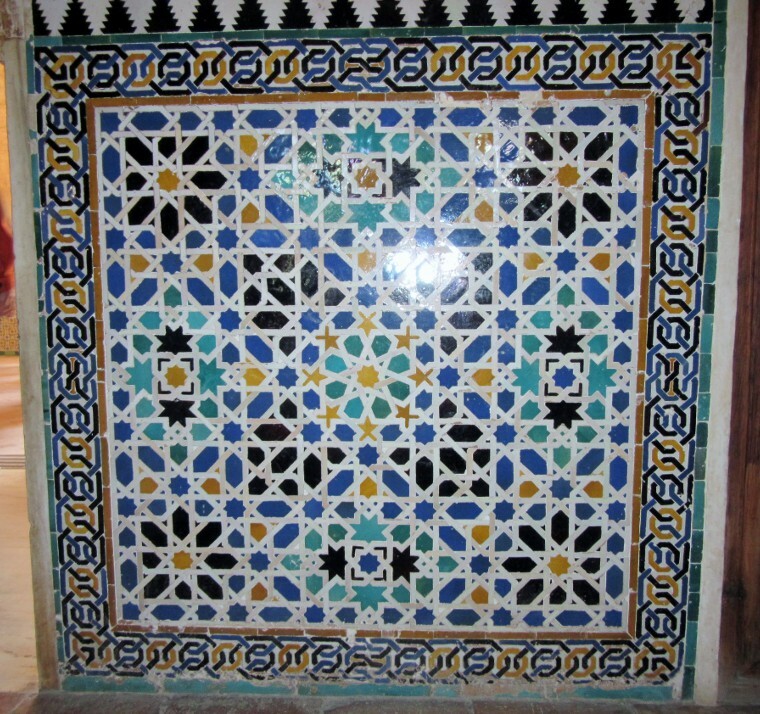 Especially love all of the mosaics and tile work. The Alhambra was not on our radar before, thanks to you, it is now. So glad we helped make the Alhambra one of your “Must See” places, Veronica and David! You’ll enjoy it most if you schedule your visit during the shoulder or low season because of the crowds (8000 per day is the limit and the times are assigned.) Having a guide was great but there are also audio tours available. The Alhambra is a place that’s worth the hype! 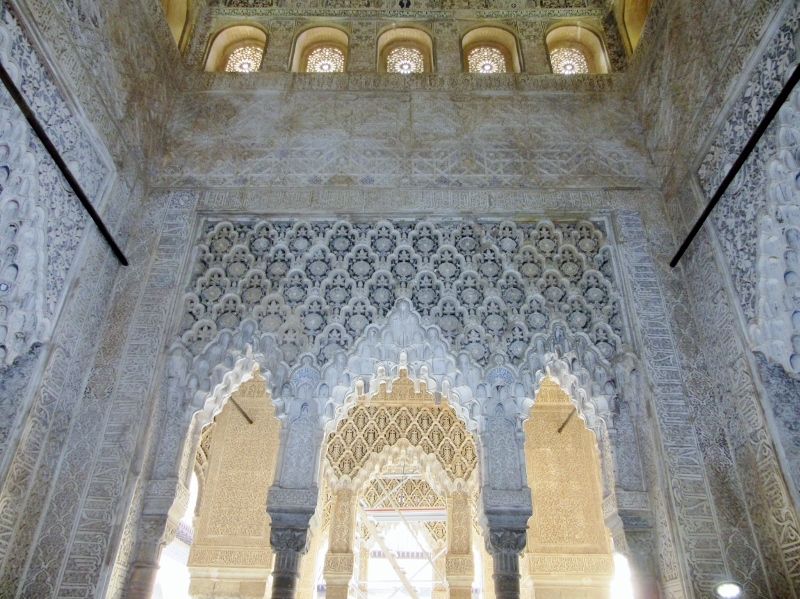 The Alhambra is truly magical, and you were wise to tour privately with a guide–and out of tourist season. There is so much to take in! It’s worth doing, even with hordes of tourists eddying about, but your in-depth visit sounds wonderful, despite the cold. 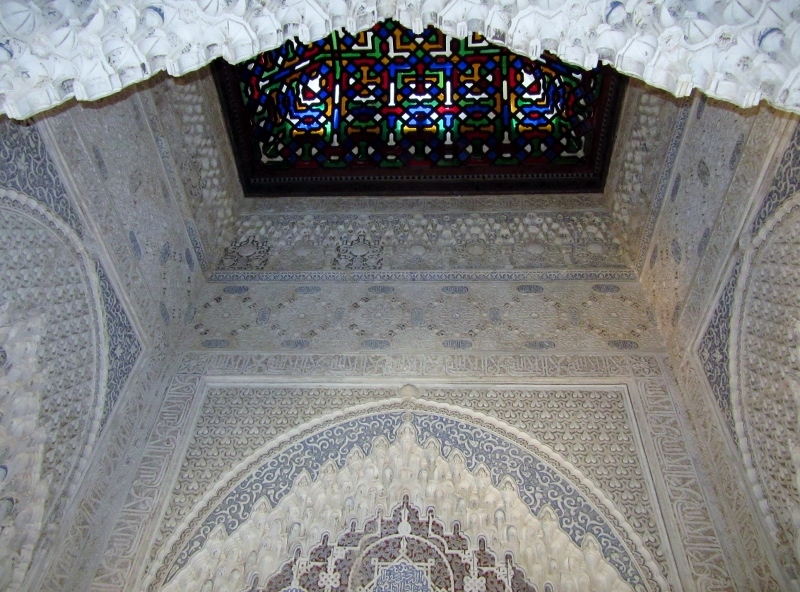 There was not too much thinking that went into hiring a private guide as the Alhambra was one of our “bucket list” places and we definitely wanted to take it at our own pace as well as ask our very knowledgeable guide questions. And we really liked the fact that, because it was the off-season, we were able to take photos without having a crowd of people to juggle around or selfie sticks in our way! What an incredible visit you have given us, laced with romance and history. The courtyard of the Generalife is so serenely beautiful, and the depth of craftsmanship on display in the adornments and furnishings is breathtaking. Wonderful tales woven in and out of your narrative! Thanks Betsy. 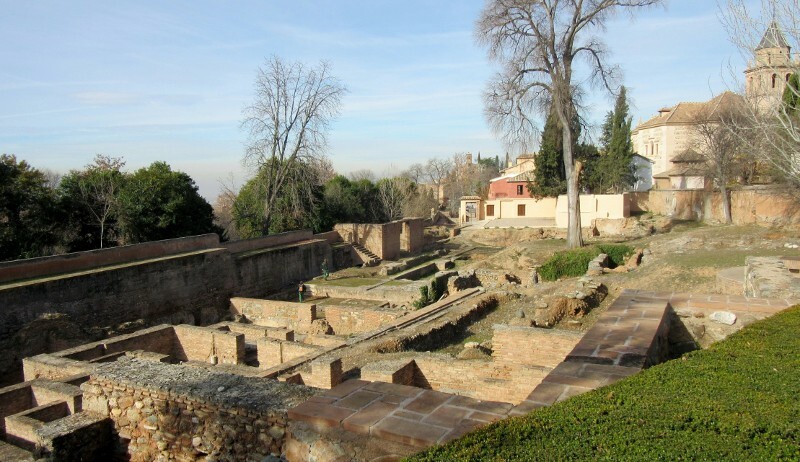 We’re so glad you enjoyed this post and were able to get a sense of what an beautiful place the Alhambra is now and what a glorious place the Alhambra was many centuries ago. And it makes you wonder about all the stories that have never been told … ! We visited this paradise in spring of last year, with all the blooms around. It was a highlight of our European tour. Didn’t know about Washington Irving’s book! We are going to Europe again next year and will be in Albufeira for a month, either in spring or fall. See you! 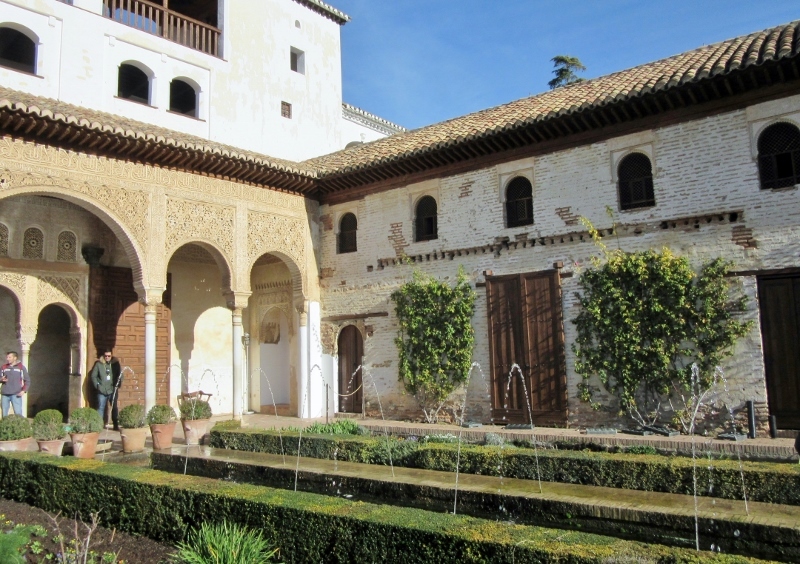 Springtime at the Alhambra would be amazing and I can just imagine how it would look on a warmer day with all the gardens in flower – magnificent! We’re looking forward to meeting you next year. You’ll love the Algarve! What a wonderful tour of the Alahambra you’ve provided. I feel like I was there but now know that until I go I won’t get the scope. Sort of like viewing photos of the Grand Canyon. No matter how good you’re not prepared for the beauty of the real thing. Great photos!! Thanks Billie. Your comparison of the Alhambra and the Grand Canyon is great. It’s just one of those places that you have to visit to get a glimpse as well as an appreciation of what it must have looked like back in its glory days! I so agree that nothing can prepare you for what you see. I went there years ago, not knowing what it even was and was amazed at how big Alhambra was. The Alhambra buildings and grounds cover an astounding amount of land and we felt like we’d gotten some exercise by the time we finished our tour. And, you’re right Jan, there’s nothing like being in an iconic place like the Alhambra to really see what an incredible place it is. Thanks for bringing back some great memories. I was also there on a very cold day, beautiful sunny day. I loved wandering around without bumping into a million others. I have you first shot in my photo collection, too! 🙂 I don’t remember that workshop. His work looks beautiful. Next time we get together we’ll have to get that crib board a go. I used to play a lot, and think I could find my crib groove again pretty fast! Traveling during the off season definitely has its positive side despite the cold. We were able to take a long private tour (4 people) and go at our own pace as well as ask lots of questions. 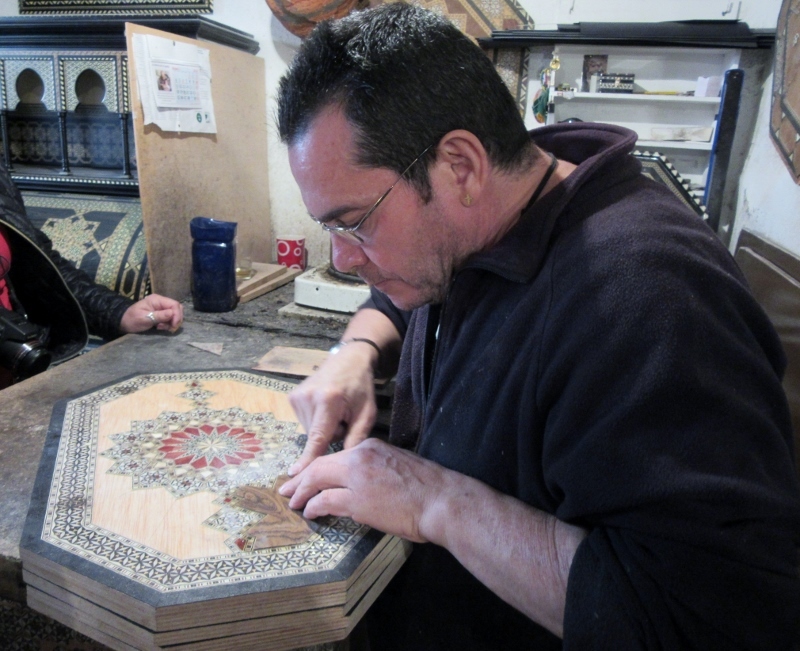 Exploring a few of the artisan shops nearby was a plus as we watched how some mosaic works are crafted and picked up a souvenir too. And yes, we’ll both take you up on some cribbage games when we see you next year. In the meantime … we’ll have to practice ourselves to get our mojo back! I’ve known about the Alhambra since I was a child but never made it there, even though I hitchhiked to Malaga as a teenager…. Looking at the incredible craftsmanship, you have to wonder how many people toiled for what endless period of time to complete this amazing place. It really is amazing to see the individual details as well as the art work combined in a room for the whole total effect. Like you, we couldn’t help but wonder how long as well as how many people worked to complete this artistic endeavor. We’d never read it either and found it on Amazon as an e-book after our tour.Your question of how long the renovation took is a good one to research but Washington Irving’s stories were credited with reviving interest in the site and keeping it from further deterioration. And maintenance and preservation appears to be an ongoing effort as we saw a couple of work crews about. I’m picturing you sitting in the shoe store – that might require some patience! Start making a list Bob and we’ll start planning. There’s so much to see and do in our neighborhood and (by Montana standards anyway) amazing UNESCO sites pretty close too. Can’t wait to share it with you guys! Your photos remind me so much of our travels through Iran – the architecture, tiles and honeycomb ceilings are incredible, aren’t they? Geography belongs in Richard’s knowledge skills, not mine (although I’m catching up fast!) and finding out that Spain also had it’s own snow-topped Sierra Nevada range made the landscape feel a little more familiar. However, there’s an ancient Roman wall running along the foothills that made the scenery even more spectacular! thank you so much for sharing your adventure with those of us who need make do with armchair travel. Made me feel I was there in 3D! So glad to have some virtual travelers tag along with us – sharing the travel experience only adds to the fun! 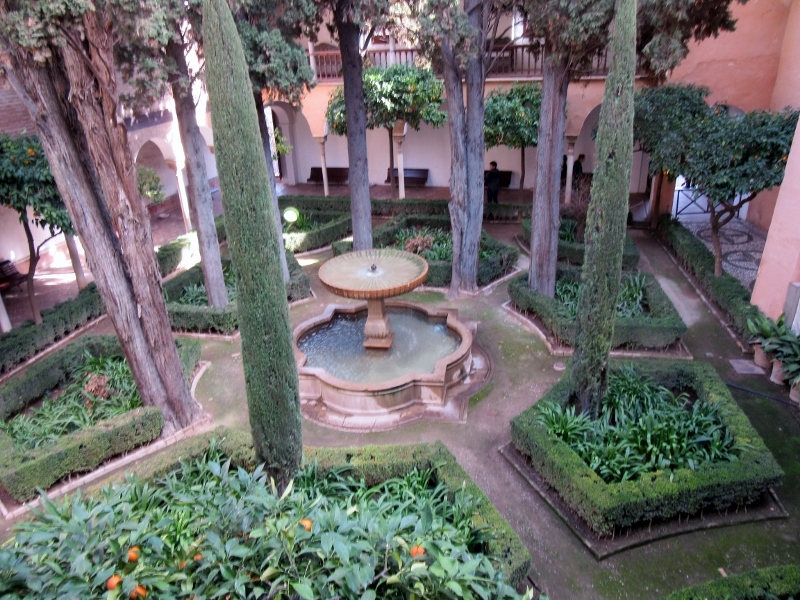 And the Alhambra is a fascinating place to read about and visit! Buying a cribbage board??? Sounds like you crazy guys are really settling down. Slippers here, a butter dish there and a cribbage board now… We are slowly acquiring the little pieces that make a place a home. You’re right – sounds like we’re settling in! Beauty abounds through your winter lens. Praise indeed and what a nice comment! It always helps when you have a great place to take pictures. How do you find such fascinating places and capture the essence with prose and photos? It is simply your talent! We love the travel life, Maida and writing about where we go makes us more observant and better travelers. The research and writing is a great hobby and keeps us learning something new every day. But sharing our stories with appreciative readers like you makes it fun! Great place, great writing!! Is there a book in the future? Stunningly beautiful! This is definitely on my bucket list! *Our bucket list, rather than getting, smaller keeps growing! Can’t wait for you to come and visit us, Nancy so that we can share our Portuguese experience with you and cross the Alhambra off your bucket list. Our close proximity to Spain is really a plus because there are so many fascinating areas to visit and it’s only about 2 hours from Lagos to the border. You’re going to love it! Your blog is a history lesson come to life. 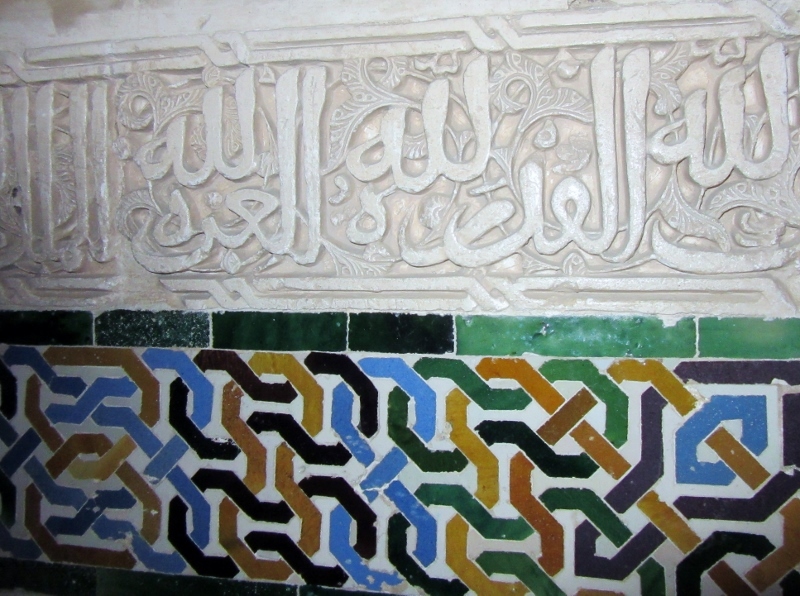 The beauty and the history of The Alhambra is fascinating. To walk where so many have walked is always daunting. As always, beautiful pictures. Looks a little too cold for me!! Thanks for shrink your adventures. OMG it was a bit too cold for us too – jeans, coats and scarves but the upside was that we didn’t have crowds of tourists to push our way through and it was easy to take photos. A fascinating place and it was awesome to think of all the people who had lived there centuries ago! Awesome! You guys wasted no time in making your visit there. We absolutely loved it there and in the town of Granada. 🙂 i think our next Europe trip might be to Slovenia. We’ve heard amazing things about the small country. You’re right about not wasting too much time Amanda – there are so many places we want to see in Europe that it’s hard to decide and we don’t want to procrastinate too long. Slovenia has been on our radar for a time too with it’s fascinating history and architecture. And it’s still enough off the beaten path that the costs look pretty reasonable. I have visited this magnificent structure. 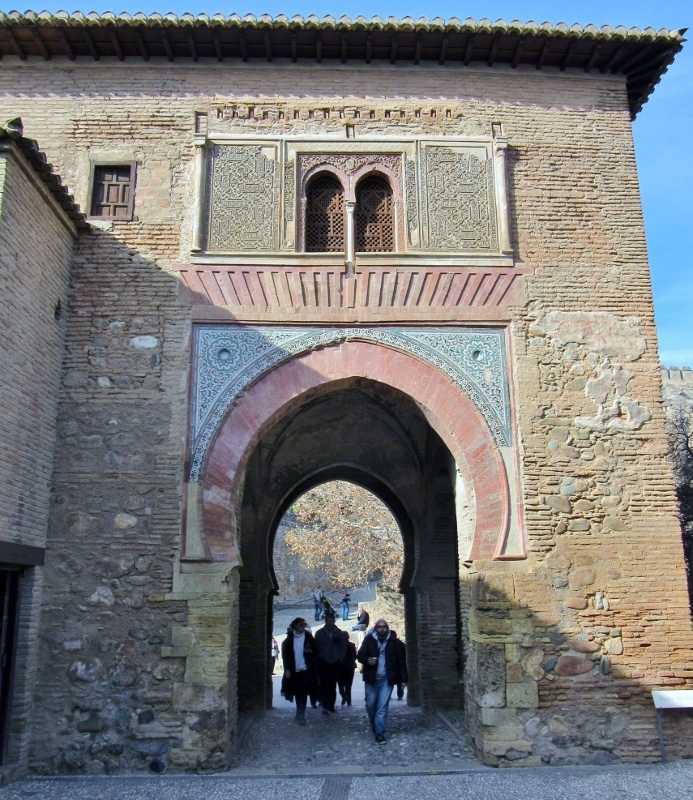 I loved the city of Granada….so unlike our Nicaragian Granada. We are still hoping for a trip there with the Granada Travel Club. We have given Bob Smith the task of making a connection since the U.S. Ambassador has now visited his home twice. Next visit he’s to get us hooked up with the Spanish contingency. So happy to see you are adventuring out into greater Europe…such fun. Looking forward to sharing some adventures in April and May. So glad to head the Granada Travel Club is still going as we enjoyed several trips with the group while we were there! And Linda, we have all sorts of places to show you plus we’ll have to find some new ones while you’re here. Bring your camera, paints and artist’s eyes because you are going to have fun! The Alhambra is on my list of places to see. The history you’ve highlighted is fascinating. It looks impressive in your photos and I’d love to see it in person. There were so many fascinating things to write about, Donna that we ended up with the “Reader’s Digest condensed version!” We could have gone on and on and … Our photos don’t do the place justice – it really is impressive. I love learning the history of places :-), not just the photos and l love this! It’s amazing the history of all these magnificent places. 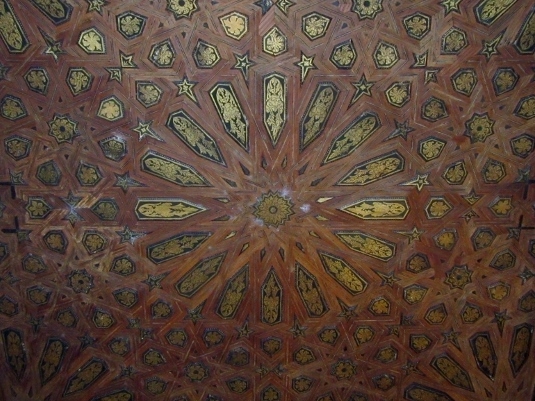 I want to visit the Alhambra. It moved down a bit after seeing Seville’s small one as it looks similar, but everyone says one needs to experience the Alhambra. We are taking it for granted as it is only a couple of hours drive l guess, but we will get there for sure. Yay for Washington Irving, otherwise it might still be a squatter’s paradise :-). 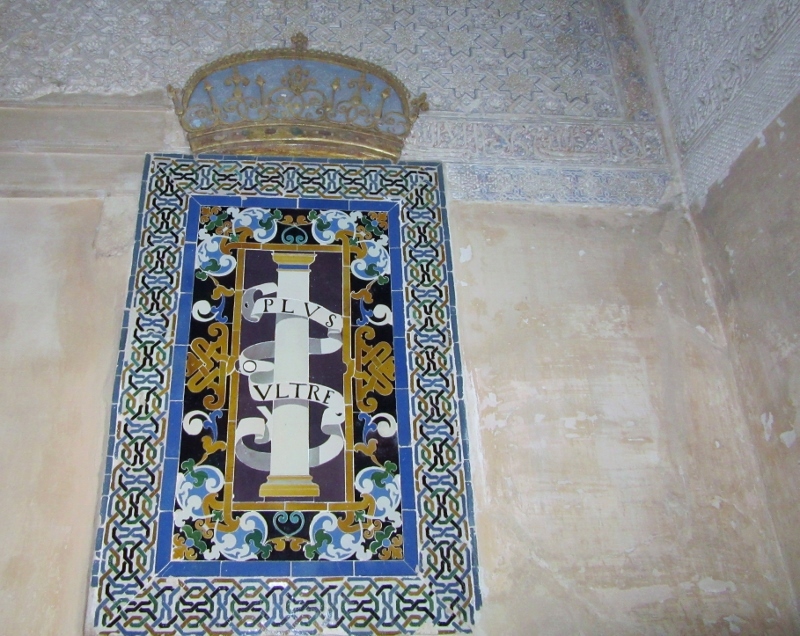 We know what you mean about not exploring sights nearby where you live and saying “someday.” We did that many times in the different places we lived and missed golden opportunities to explore our own neighborhoods, Sevilla has the magnificent Alcazar but, when you get to the Alhambra to explore it, we know you’ll be glad you did! Thank you. You’re right about it being a magical place that captures the imagination. If we had a bucket list this would have been one of the items on it so we’re glad we finally had a chance to learn more about it and FINALLY see it for ourselves!